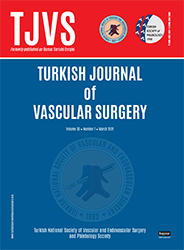 1Gülhane Askeri Tıp Akademisi Kalp ve Damar Cerrahisi Anabilim Dalı, Etlik-Ankara Vascular complications related to lumbar disc operations are rare but extremely fatal conditions. We retrospectively analysed 13 cases of vascular complications occurred during lumbar disc operations between the years 1988 and 2000. Surgical approach was through L5-S1 in one case and, L4-L5 in the others. The most commonly effected ves­ sels were left arteria iliaca communis (42,1%) and left common iliac vein (21%). in 8 of the patients shock or pre­ shock was developed because of haemorrhage on acute phase. Missed injuries which were appeared at lale posto­ perative period were pseudoaneurysm in 4 cases and arteriovenous fistula formation in 1. The most specific symptom in diagnosis was the hypotension which was resistant to medical therapy. Three of the cases at lale postoperative pe­ riod were asymptomatic. Of the 13 vascular injury diagnosed at the acute phase, 8 were arterial. Four of them under­ went Dacron graft interposition and 1 saphenous vein graft interposition. Remaining 3 arterial and 5 venous injury we­ re repaired by primary suturation. in 2 cases in which Dacron graft interposition had been performed gratt infection de veloped. There was no operative mortality. During mean 5 _ years (3 months-12 years) follow up period none of the patients had any problem related to vascular injury.